Do you want to find backlinks that you can easily replicate for your website? You should; backlinks are one of Google’s top two ranking factors. How do we know? They confirmed it a couple of years ago. Pages with lots of backlinks also tend to get more traffic from Google, according to our study. 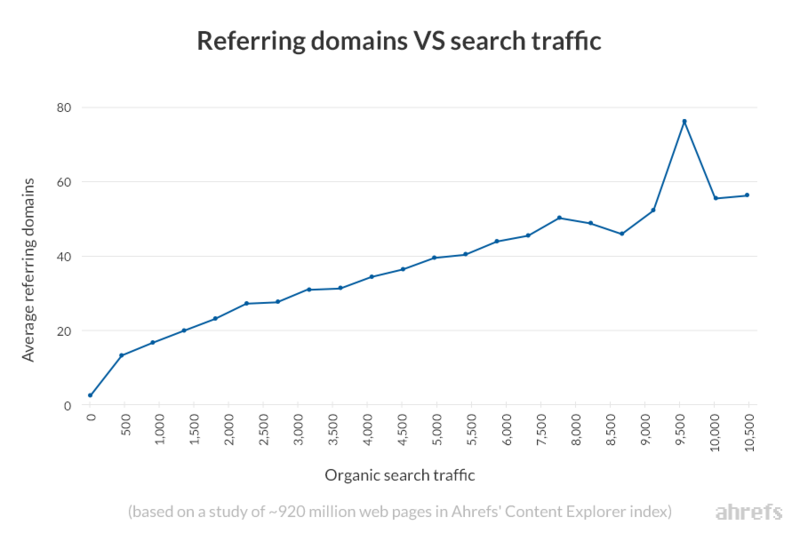 This is a correlation study, as almost all SEO studies are. We can’t confirm causation. But, in saying that links are one of the top ranking factors, Google has pretty much done that for us. But how do you find replicable, needle‐moving backlinks anyhow? Find out where your competitors get their links from, then replicate them. Not sure who your competitors are? They’re the sites that already rank high in Google for the search queries you want to rank for. Your job is to find (and replicate) the backlinks that helped them get there. Do you want to find more competitors? Use the Competing domains report in Site Explorer to see the sites that compete with yours in the SERPs. Keep in mind that this will only work with established sites. If your site is new and doesn’t yet rank for anything, you may not see great results here. For us, one competing site would be backlinko.com as it ranks for a ton of search terms that we want to rank for. Same goes for moz.com. But how do we know where their backlinks come from? This data comes from Ahrefs’ industry‐leading backlink database which contains 212 BILLION pages. It was built by crawling the web and is updated every 15–30 minutes. We also crawl 4.1 million pages every minute! We crawl so fast, in fact, that Ahrefs’ crawler outperforms Bing, Yahoo, and Yandex. The bottomline? You can use the Backlinks report Site Explorer to check backlinks to any website or web page. So if you enter a competitor’s site, you’ll see all their backlinks. How is this useful? Because some of your competitor’s links helped them to rank well. Your job is to find those links and replicate them. But this report often uncovers hundreds of thousands of backlinks…. … so how do you know which ones are potential replicable? You should always research backlinks on a page‐by‐page basis. This is crucial. I repeat: if your goal is to steal backlinks, do not look at the backlinks pointing to a competing website as a whole. You won’t learn much from this. Always start by researching the page from which you’re trying to replicate backlinks. If your goal is to build links to your homepage, it’s fine to start your research from a competing homepage. Just make sure you’re researching the individual URL, not the entire website. How do you choose a page to research? It comes down to your circumstances and goals. If you want to build links to existing content on your site, start by finding similar content that already has backlinks. For example, if we wanted to build links to our list of SEO tips, we’d start by researching a similar list of tools that has some backlinks, like this one. If you want to create new content with the goal of attracting links, start by studying what works for competitors. For example, if we were doing this for ahrefs.com, we may start by researching what kind of content attracted the most links for a site like backlinko.com or moz.com. Let’s take a look at how to find replicable backlinks in each of these cases. Let’s assume that we want to build backlinks to ahrefs.com but we don’t yet have any content. First, we need to find a page that has a lot of backlinks. We’ll then take inspiration from this page and create something similar, but better. Finally, we’ll use this newly‐created content to replicate some of the links to the original page. To start, let’s see which pages attracted the most backlinks for one of our competitor’s, moz.com. For this, we’ll use the Best by Links report in Site Explorer. In this particular case, you’ll notice that some of these pages are irrelevant given the task at hand. We don’t want product and service pages included here; we only want to see links to content on their blog. To do this, we can use the “prefix” mode in Site Explorer. This restricts data to only a subsection of a website (e.g., moz.com/blog*). It has over 2,500 backlinks from 1,021 referring domains. I’m pretty sure we could create something similar to (and better than) this, don’t you!? It’s not always necessary to create a better version of an exact page. You could also use this report to find out what type of content is likely to attract backlinks, then create something slightly different. For example, a lot of the most‐linked‐to pages on backlinko.com are studies. So, if we were trying to create content that attracts backlinks for ahrefs.com, creating an experiment or case study would be the best course of action. But we don’t even have to “copy” these exact topics. For example, instead of effectively “skyscrapering” that voice search SEO study (see screenshot above), which focuses on Google Home optimization, we could instead do a similar study for Alexa voice search. 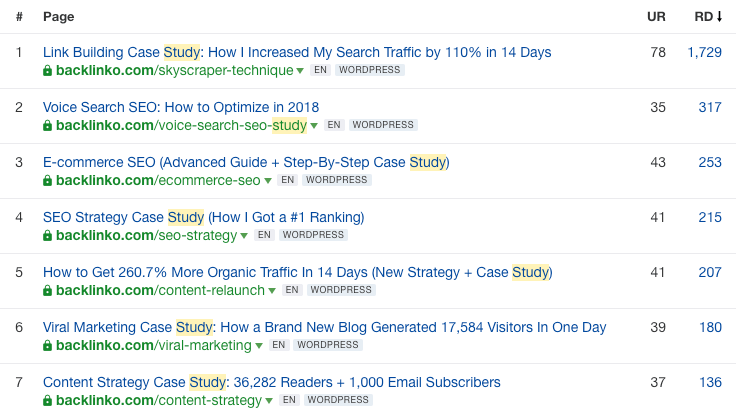 People who link to the voice SEO study will likely be open to linking to our Alexa study because it adds value to the conversation. Alternatively, we could create a super in‐depth guide to the role schema markup plays in voice SEO. This is something Brian mentions in his voice SEO study, but he doesn’t go into much detail about it. I’m sure people who linked to Brian’s guide would also be willing to link a post that expanded on this point. But what if we already had a page to which we wanted to build backlinks, such as our on‐page SEO guide? This would require a different approach, as we’d instead need to find similar pages that already have backlinks. … but that’s a bit long‐winded, so I prefer to use the SERP overview in Keywords Explorer which shows backlinks to all the top 10 pages at once. Want to see the backlinks for the top‐100 pages? Change your Google search settings so it shows the top 100 results, scrape them, paste them into Ahrefs Batch Analysis tool, then sort by referring domains. We can also find relevant pages with lots of backlinks using Content Explorer. Content Explorer is like a mini‐search engine powered by a database of almost one BILLION pages. Search for something and it’ll kick back all the pages that mention that term in the content (or in their title tag, if you select that option, which I recommend). 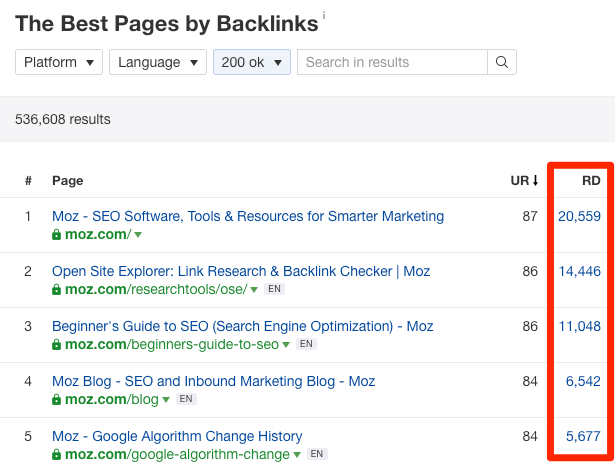 You can see that we got 9,478 results for “on page seo,” one of which happens to come from our competitor, backlinko.com. Being as we already have a similar page to this, I’ll stick with this example for the rest of the article. Once you’ve found a page from which you want to replicate backlinks, paste the URL into Site Explorer and go to the Backlinks report. You’re now going to examine the backlinks for this page (and any other relevant pages you found) one by one. Are actually possible to replicate. Link prospecting cannot be fully‐automated. Some degree of manual vetting is always required. But what if the backlinks report for the page you’re viewing looks like this? Nobody has the time to manually vet that many links, right? You don’t need to. The truth is that a lot of the links won’t be worth pursuing, such as those that are low‐quality, nofollowed, or from foreign‐language pages. That last filter is an important one. It filters for links that appear on blogs, which are almost always in‐content editorial links. These are the powerful links that everyone wants. It’s rumoured that Google sees backlinks from pages with significant traffic as more valuable. If Google is sending traffic to the linking page, then they must see that page as valuable. So, although Google has never confirmed it, I do think it would make sense that any pages associated with these “proven” pages are also seen as high‐quality by power of association. It will lead to more referral traffic. Remember that the original point of links has nothing to do with SEO. They provide a way for people to navigate the web. You click a link, it takes you to a destination. That’s why it’s called a link. The more traffic the referring page has, the greater the chance that someone will click on your link and land on your site. This is known as referral traffic. It will lead to more links on autopilot. 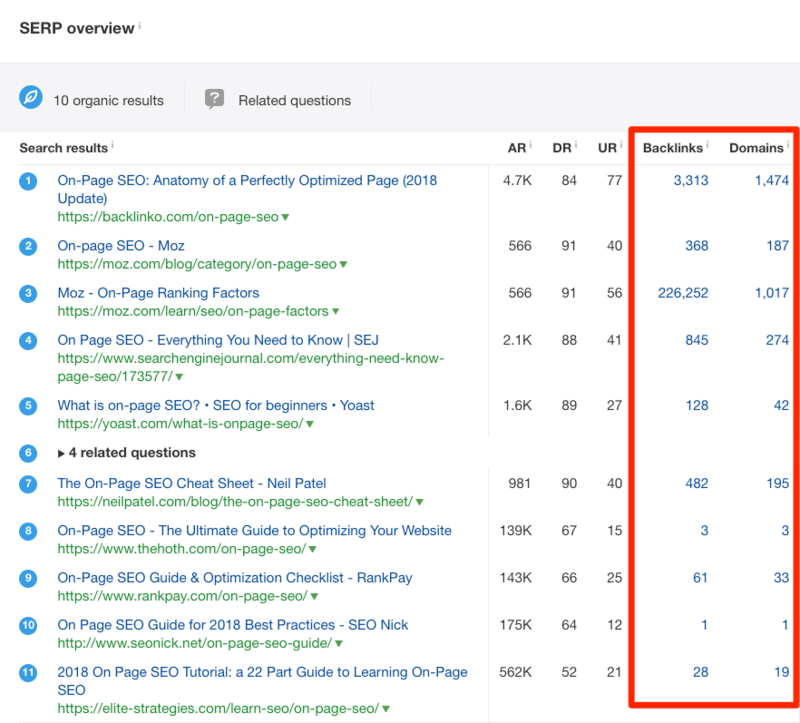 No matter what tactic you’re using to attract backlinks, the starting point is always the same: the potential linker first has to become aware that your content exists. Negate this first step and there’s no possible way they can link to it, no matter how great it is. Links on pages with lots of traffic will get your content in front of more eyeballs which, in turn, leads to more links. You’ll notice that there are already far fewer backlinks to vet: 795 rather than 4,485. This is a much more manageable number. This is where a lot of so‐called marketers get lazy. What do you think? Perhaps this would make a nice addition to the post? Don’t do this. Your conversion rate will be very low. You’ll annoy people. And you’ll burn bridges. I’m not saying you won’t be able to build any links by doing this. If you do it at scale, you will. It’s just not something we recommend because you’ll burn through a lot of prospects. Figure out if, and how, swapping out or adding your link will add value to the linking page. Did you notice that I bolded the word “if” in that second point? That’s because it’s not always appropriate to ask the author to swap out the existing link in favor of yours, or even add your link to the page. You should only ask if there’s a compelling reason to do so. That’s why it’s so important to understand the context of the link and the reason it was given. If you can identify which one of these was the catalyst for the link, then you can often figure out how to replicate it. You can spot these by looking at the anchor and surrounding text in the “anchor and backlink” column. If the link exists within a sentence, it’s a contextual recommendation. These are generally regarded as the best links one can get. The problem? Replicating them can be rather difficult. Bloggers usually link in this way when they’re a fan of a specific article, so a quick “hey, our post is better, can u link to that instead pls?” isn’t going to cut it. The article they’re currently linking to is categorically worse than your article, by a long shot (i.e., the “skyscraper” approach). If any of those apply, feel free to go for it with a direct pitch. Find something unique about your article. Did you talk about something that your competitor didn’t? Did you offer a unique viewpoint? Did you disprove something they said? You can usually find something. Use that as a “soft pitch.” Let the author of the linking page know about your article via email. Don’t ask for a link. Just say that you saw they mentioned X in their article and that they might be interested in reading Y, because [insert unique angle here]. The aim here isn’t to convince them to swap out the link. It’s to introduce them to your content and spark a relationship. People link to others that they know and like, so it’s well worth building relationships with those who regularly link out to other blogs in their niche. That way, they may link to you in future. And yes, this is a long‐term play. Honestly, that’s pretty much the only way you will get truly great links. You can see from looking at the anchor and surrounding link text that the author quoted a fact from this post. They linked back (contextually) as the source of the data. Better definition. Does it make sense? Is there a better definition in your article that would be a better replacement? Tell them. But here’s the thing: these ideas can work, but only in quite specific circumstances. Your best bet with source links is to take a more holistic approach and look for trends. If you notice that a competing article has lots of source links for a specific reason (e.g., lots of people embedding a graphic from the post), you may want to refine your content with this in mind. If a high percentage of links are the result of image embeds, include a similar image in your post. If they’re the result of a definition being quoted, add a definition to your post too. If most of the links occur because of a statistic… well, you get the idea! People link out to others that they know and like. It’s just human nature. 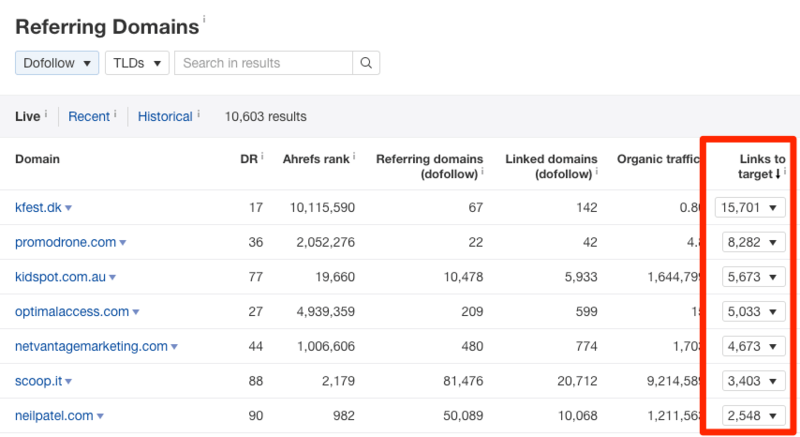 But how do you spot whether a site has a relationship with another site by looking at the Backlinks report? You can’t. For this, you need to enter your competitor’s domain (yes, domain!) into Site Explorer and check the Referring domains report. This will show you all the unique sites that are linking to your competitor’s domain and, crucially, how many times they’ve each linked. You can then scan through this report looking for domains that you recognise, or even just domains that sound legit and relevant. Ignore any junk. No, your eyes don’t deceive you. That’s 2,500+ links from neilpatel.com to backlinko.com. It doesn’t take a genius to work out that Neil must be a big fan of Brian. He clearly respects his work… enough to link to it 2.5K times, apparently! How does this help you? These are the people with whom it pays to build relationships, as they publish a lot of content and have a tendency to link out to the same sites over and over again. That’s not to say that this should be your only reason for doing this. Build relationships with people that you like and admire. Don’t fake it just for links! Paid links are, well paid links. People buy these links from bloggers for an average price of $361.44. Unnaturally placed—i.e., shoehorned where it doesn’t really belong. It probably goes without saying that you shouldn’t try to replicate these links. I just wanted to mention this one briefly as you need to be aware of it. Otherwise, you can waste a lot of time. If you reach out to a blogger and they ask for money, make a note not to contact that website again and move on. Chances are your competitor paid for a link from that site, and that’s not a game we recommend you get involved in. Are the four reasons above all‐encompassing? Not at all. You should always judge each link individually. If you’re unsure about the context or reason for the link, click through and visit the actual linking page. Hit CTRL/CMD+F and search for the anchor text. This is sometimes the only way to understand the real reason a link was given. We know where it links from and to, but the word “here” as the anchor text doesn’t tell us anything about why this link exists. But if we look at the linking page, it becomes instantly clear. 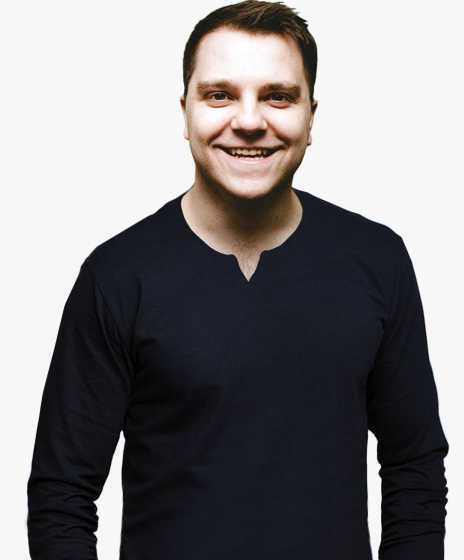 The author used the “content upgrade” from Brian’s post as an example in his article. 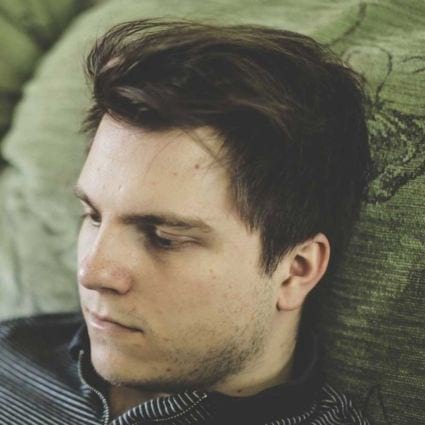 Is this link replicable? Not for us. But if you happen to have a so‐called content upgrade in your post, it may make sense to reach out and offer this as another example for inclusion in the post. (It’s probably worth building up a relationship before doing that, though). Can you rank without backlinks? Yes, it is possible. But it’s rare. How do we know? 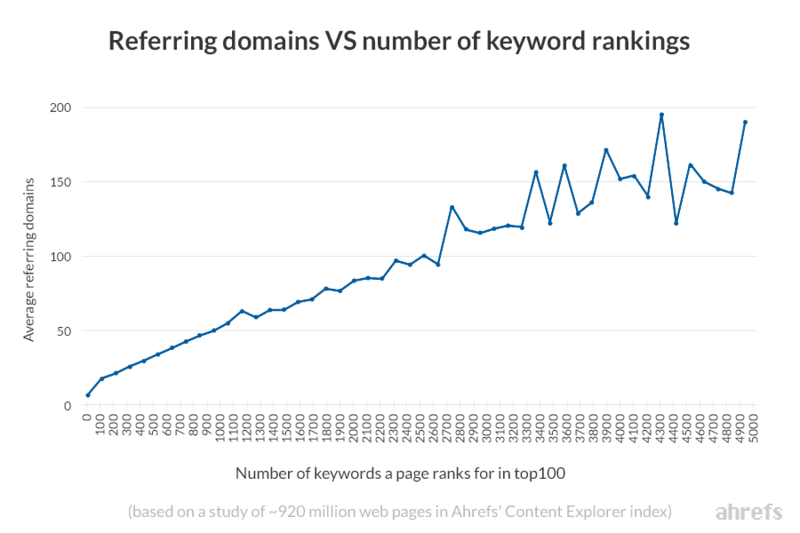 Because there’s a positive correlation between the number of referring domains to a page and the number of keywords it ranks for (in the top 100). Just to reiterate, this graph is the result of a correlation study. It does not definitively prove causation. Google has stated that backlinks are one of the top two ranking factors, though, so we can say with reasonable certainty that it is, in this case. But what if there was a way to identify topics you may be able to rank for with few or no backlinks? That would be cool, right? 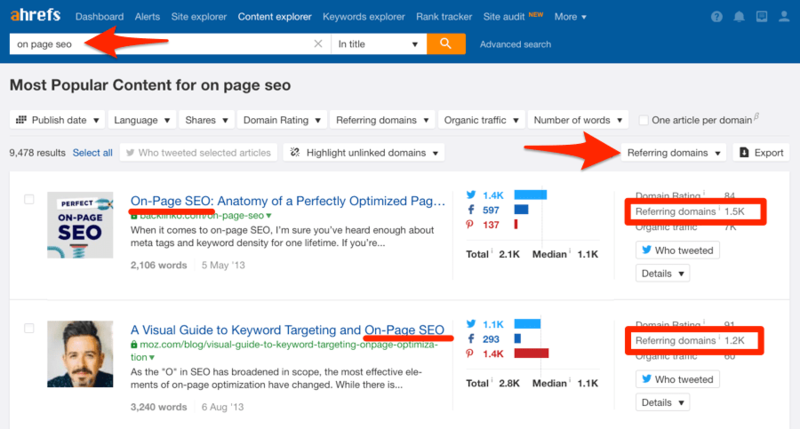 Just to refresh your memory, Content Explorer is like a mini search engine built into Ahrefs. It runs off our database of almost one BILLION pages. You use it the same way you would Google. Type something in and we’ll kick back any pages that mention your keyword(s) from our database. But for this hack, we also need to add a few filters. This filters for pages that have few referring domains (backlinks) and at least five‐hundred monthly visits from Google. You should be able to rank for these topics without the need for many backlinks at all. Watch Sam Oh’s video to learn about even more cool Content Explorer hacks. Backlinks aren’t always easy to replicate, especially the needle‐moving ones. But that’s a good thing. It’s difficult for everyone, not just you. This creates a level‐playing field where rankings are dictated primarily by content quality. That said, it’s not enough to simply create high‐quality content. People also need to know it exists, especially those with the power to link. This is where blogger outreach comes in. Want more actionable ways to steal your competitors’ links? 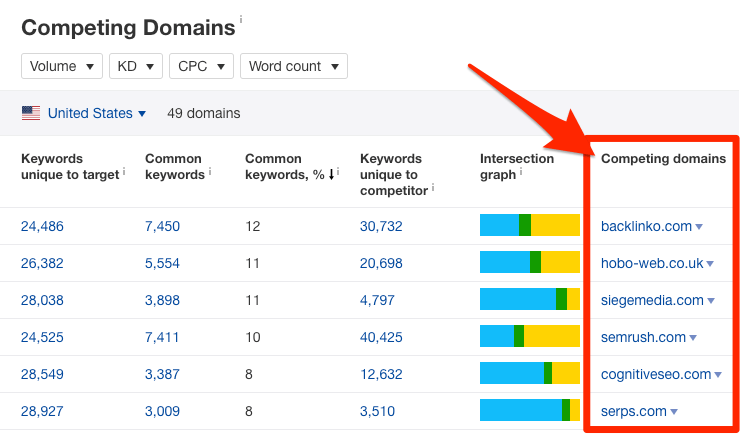 See our list of seven actionable ways to loot your competitors backlinks.